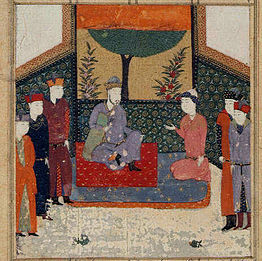 Abū Ḥamīd bin Abū Bakr Ibrāhīm (c. 1145 – c. 1221; Persian: ابو حامد بن ابوبکر ابراهی��‎), better known by his pen-names Farīd ud-Dīn (فرید الدین) and ʿAṭṭār (عطار, Attar means apothecary), was a twelfth-century Persian poet, theoretician of Sufism, and hagiographer from Nishapur who had an immense and lasting influence on Persian poetry and Sufism. 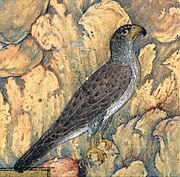 Manṭiq-uṭ-Ṭayr [The Conference of the Birds] and Ilāhī-Nāma are among his most famous works. Judging from `Attar's writings, he approached the available Aristotelian heritage with skepticism and dislike. He did not seem to want to reveal the secrets of nature. This is particularly remarkable in the case of medicine, which fell well within the scope of his professional expertise as pharmacist. He obviously had no motive for sharing his expert knowledge in the manner customary among court panegyrists, whose type of poetry he despised and never practiced. Such knowledge is only brought into his works in contexts where the theme of a story touches on a branch of the natural sciences. According to Edward G. Browne, Attar as well as Rumi and Sana'i, were Sunni as evident from the fact that their poetry abounds with praise for the first two caliphs Abu Bakr and Umar ibn al-Khattāb - who are detested by Shia mysticism. According to Annemarie Schimmel, the tendency among Shia authors to include leading mystical poets such as Rumi and Attar among their own ranks, became stronger after the introduction of Twelver Shia as the state religion in the Safavid Empire in 1501. The fourth valley is introduced as the valley of detachment, i.e., detachment from desire to possess and the wish to discover. The birds begin to feel that they have become part of a universe that is detached from their physical recognizable reality. In their new world, the planets are as minute as sparks of dust and elephants are not distinguishable from ants. It is not until they enter the fifth valley that they realize that unity and multiplicity are the same. And as they have become entities in a vacuum with no sense of eternity. More importantly, they realize that God is beyond unity, multiplicity, and eternity. Stepping into the sixth valley, the birds become astonished at the beauty of the Beloved. Experiencing extreme sadness and dejection, they feel that they know nothing, understand nothing. They are not even aware of themselves. Only thirty birds reach the abode of the Simurgh. But there is no Simurgh anywhere to be seen. Simurgh's chamberlain keeps them waiting for Simurgh long enough for the birds to figure out that they themselves are the si-murgh — si (سی, "thirty") + murgh (مرغ, "bird"). The seventh valley is the valley of deprivation, forgetfulness, dumbness, deafness, and death. The present and future lives of the thirty successful birds become shadows chased by the celestial Sun. And themselves, lost in the Sea of His existence, are the Simurgh. 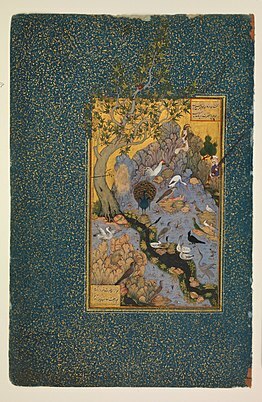 The Diwan of Attar (Persian: دیوان عطار‎) consists almost entirely of poems in the Ghazal ("lyric") form, as he collected his Ruba'i ("quatrains") in a separate work called the Mokhtar-nama. There are also some Qasida ("Odes"), but they amount to less than one-seventh of the Divan. His Qasidas expound upon mystical and ethical themes and moral precepts. They are sometimes modeled after Sanai. The Ghazals often seem from their outward vocabulary just to be love and wine songs with a predilection for libertine imagery, but generally imply spiritual experiences in the familiar symbolic language of classical Islamic Sufism. Attar's lyrics express the same ideas that are elaborated in his epics. His lyric poetry does not significantly differ from that of his narrative poetry, and the same may be said of the rhetoric and imagery. Argentine writer Jorge Luis Borges, used in one of his short stories, The Approach to Al-Mu'tasim, a summary of The Conference of the Birds as a reference. In 1963 the Persian composer Hossein Dehlavi wrote a piece for voice and orchestra on Attar's 'Forugh-e Eshgh'. The piece received its first performance by Saba Orchestra and the vocalist Khatereh Parvaneh at the National Television in Tehran. In 1990 the opera singer Hossein Sarshar performed this piece as well which its recording is available. ^ Seyyed Hossein Nasr, "The Garden of Truth: The Vision and Promise of Sufism," HarperCollins, Sep 2, 2008. page 130: "Attar has traversed the seven cities of Love, We are still at the turn of one street!" ^ Iraj Bashiri, "Farid al-Din `Attar"
^ "Central Asia and Iran". Angelfire.com. Retrieved 2012-02-23.